Disclosure: This post is part of a sponsored campaign I’m doing as an Origami Owl® ambassador. All thoughts and creativity are my own. It’s time to party in style. 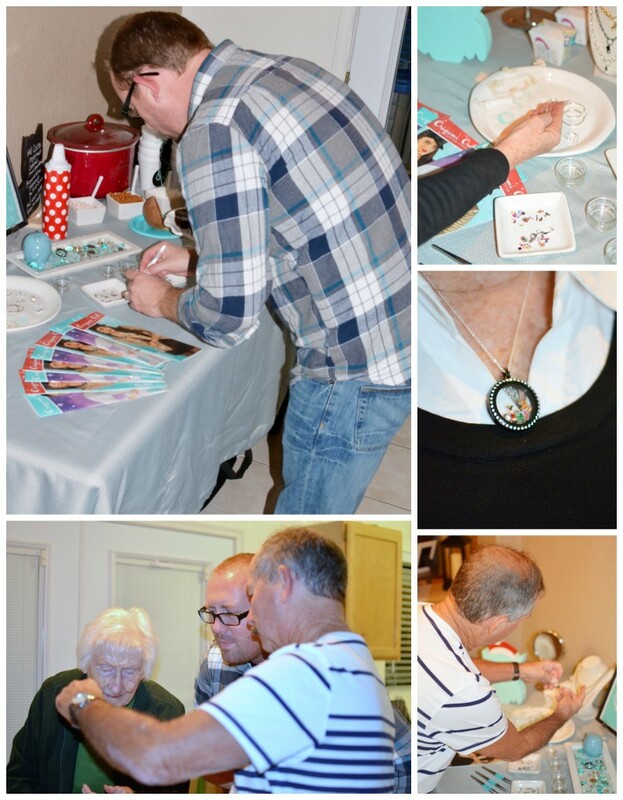 This past week I got together with my family to host a Jewelry Bar®; a unique concept in home parties. The Jewelry Bar is a highly portable party experience that puts the creativity directly at your fingertips. I hosted an in-home event and then took everything on the road to Thanksgiving dinner. I’ve worked with other companies before and had to plan days in advance to transport everything. It was nice to be able to pack and go in just a few minutes in a compact space. I hosted a co-ed pre-holiday shopping event. It was a fun evening complete with a hot chocolate bar. Everyone mingled and enjoyed treats and a warm drink while they shopped. It was an easy way to have a family get together before the hustle and bustle of the season. The ladies could play with the jewelry and make a wish list. Then the guys got to go shopping. 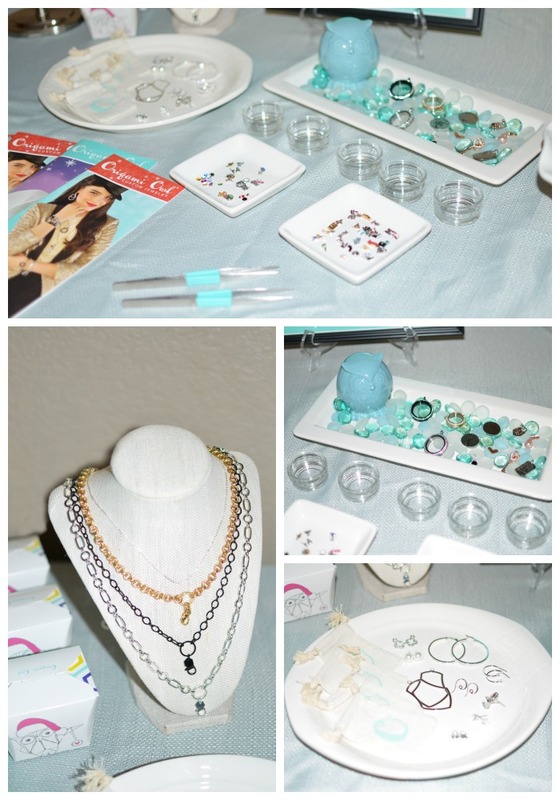 Hosting a Jewelry Bar is so easy and inexpensive. 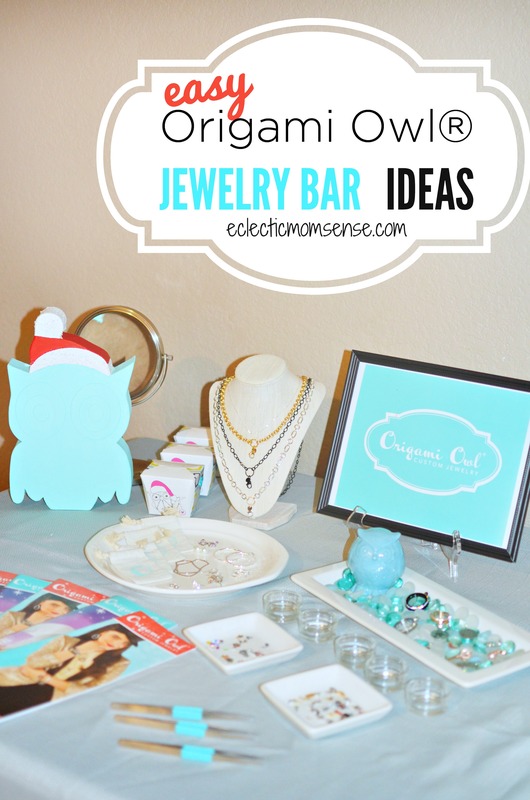 The style of Origami Owl is clean, modern, and vibrant making an easy party theme. I stuck with a clean base for everything and added a pop of color and personality with owls, red and aqua accents. White plates and dipping bowls are perfect for holding small items like charms and earrings. For the main attraction I lined a rectangular plate with glass marbles. A tiny painted owl sits watch over the gorgeous dangles and Living Lockets. A jewelry bust was perfect for displaying the variety of chains that come in the kit. All that’s left to finish your clean, modern display is a few takeout menus, votives, tweezers, and a mirror. 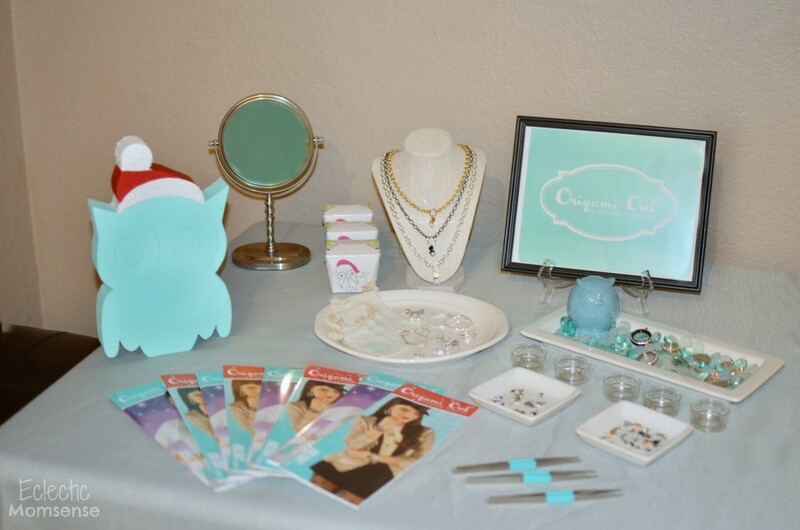 Fill in the empty space with another adorable owl and the Origami Owl sign framed. It’s that simple. My whole display fit within a small box that can easily be transported. The portability of the product makes it appealing for more than just in-home events. 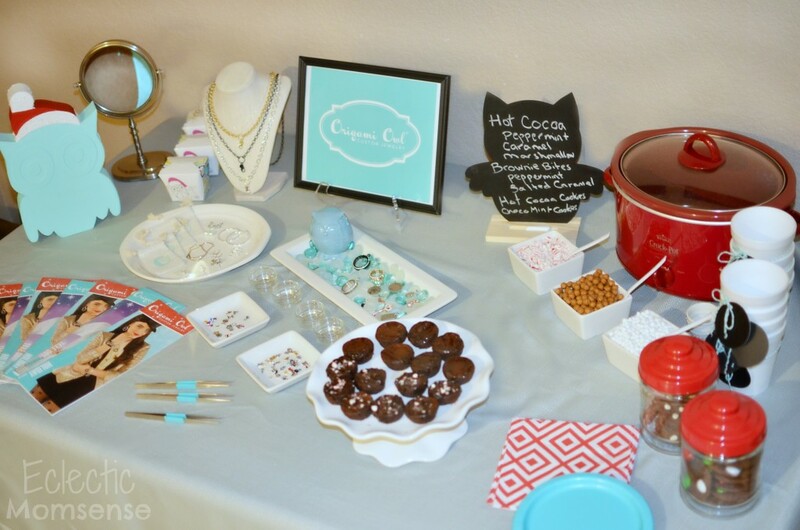 Jewelry Bars can happen anywhere: vendor events, lunch room, office, even the dinner table. At Thanksgiving before scouring the Black Friday ads my family passed charms and lockets around and went shopping. Food at your Jewelry Bar can be simple and clean too. 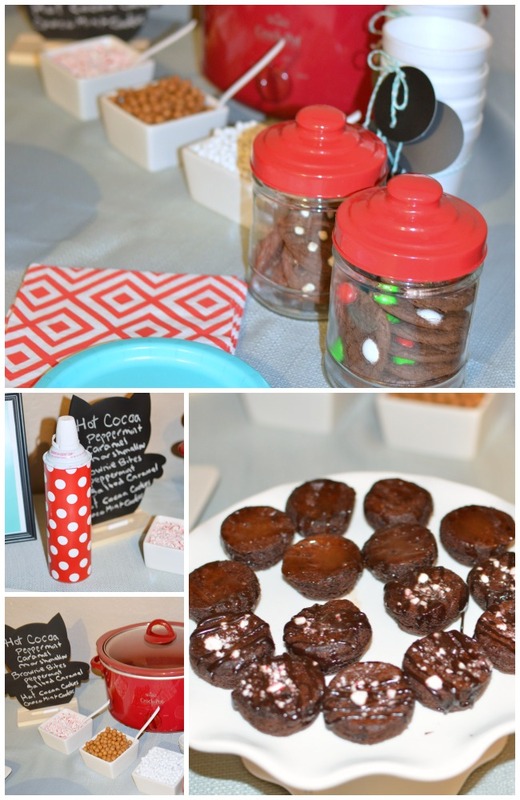 I let the holiday shopping event help shape my hot chocolate bar theme. I used the brand colors to inspire the food, allowing for table that worked seamlessly worked together. I found an owl shaped chalk board on clearance at my local craft store and used that to list the food offerings. A crock pot kept the hot chocolate warm throughout the evening. Jewelry Bars are the perfect opportunity to enjoy the company of your friends and family while earning a shopping spree. 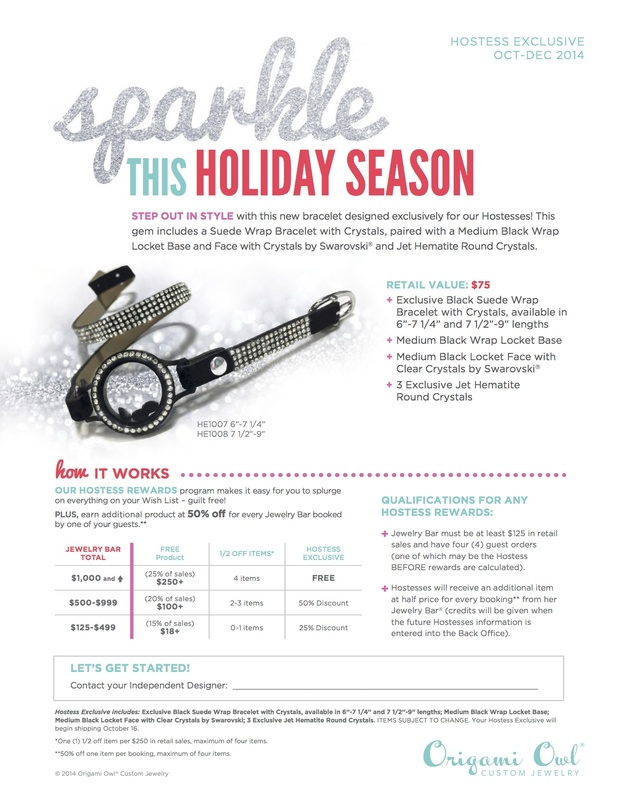 Origami Owl rewards their hostesses with free product, 1/2 price items, and hostess exclusives.